Sharjah: The second edition of the T10 League has been producing record-breaking performances at the Sharjah Cricket Stadium. On Friday night Northern Warriors, made up of mostly West Indies cricketers, posted the highest total in T10 League’s history when they scored a whopping 183-2 in 10 overs against Punjabi Legends. It was the third day in succession that the T10 League witnessed a record shattering performance. On the first day, Rajput’s Mohammad Shahzad, during the course of his unbeaten 74 runs in 18 balls, equalled the record for the fastest half-century in 12 balls, thereby sharing the honour with West Indies’ Chris Gayle, India’s Yuvraj Singh and Afghanistan’s Hazratullah Zazai in T20 Internationals. On the second day, Bengal Tigers’ Yaseer Amin bagged four wickets off four consecutive balls for one of the deadliest spells in shorter-format cricket. The Friday crowd, which had witnessed breezy half-centuries form Andre Fletcher and Brendon McCullum got to also watch a shower of sixes and boundaries from the Warriors. Their score of 183-2, at a run rate of 18.3 broke the previous record for the highest score in this league held by Punjabi Legends in the first edition when the scored 132-1 in 9. 1 overs against Pakhtoons on December 17, 2017. In this edition, Bengal Tigers almost broke Legends’ record by scoring 130-1 against the Warriors. West Indies rising star Nicholas Pooran was the architect of this new benchmark that has been set by the Warriors. 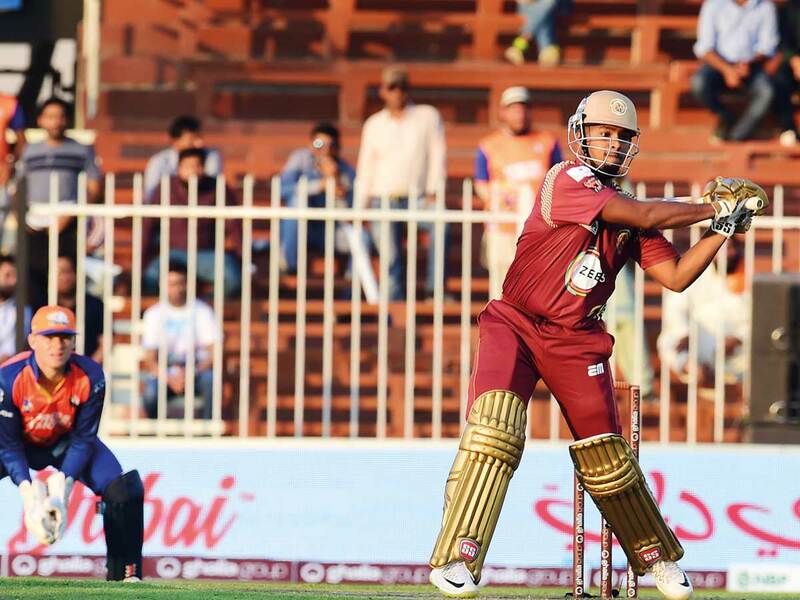 He top scored with 77 runs off 25 balls with 10 sixes and two boundaries. He was backed by his opening partner Lendl Simmons with 36 runs. Andre Russell hit an unbeaten 38 and Rovman Powell with an unconquered 21. Shocked by such big hits, the Legends could muster only 84-7 in their 10 overs and lost by 99 runs. The Warriors have also earned the honour of recording the biggest margin of victory by runs. For Pooran, the UAE has played a special role in his career. He made his T20I debut against Pakistan in September 2016 and has played so far in five T20s. It was through his sterling performances in the Under-19 World Cup in UAE in 2014 that he caught the attention of West Indies national team selectors. In the Dubai stadium where he made his T20 debut, during the Under-19 match, he cracked a stupendous 143 against Australia. Pooran had flown in for the T10 Leauge after hitting an unbeaten 53 against India in T20 at Chennai. He is the most-wanted shorter-format player and plays for Mumbai Indians in IPL, Islamabad United in the PSL, Khulna Titans in the BPL, City Kaitak in the Hong Kong T20 blitz. Man of the match: Nicholas Pooran.